Welcome to Vol. 4 Iss. 4 of the VOX-Pol Newsletter. 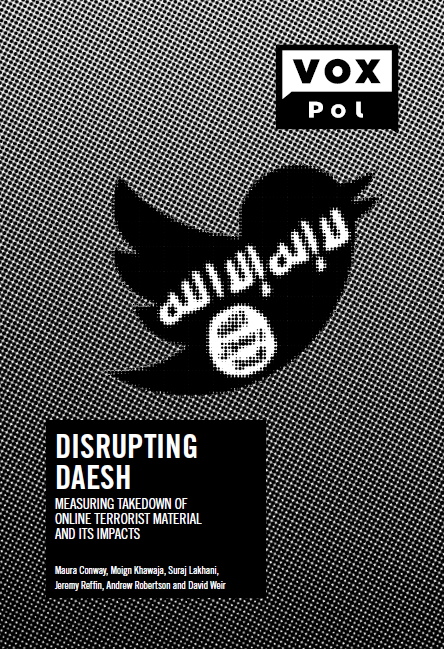 VOX-Pol’s latest report, Disrupting Daesh: Measuring Takedown of Online Terrorist Material and its Impacts, was published on 15 August 2017.
d its impacts. It challenges the idea that Twitter remains an effective environment for IS, but points out that not all jihadists on the site experience the same level of disruption. All VOX-Pol reports are open-access. This report is available for download here. If you would like to receive a hardcopy of the report, please email info@voxpol.eu with your request. Elizabeth Pearson’s article, based on her work through VOX-Pol’s Research Mobility Programme, titled Online as the New Frontline: Affect, Gender, and ISIS-Take-Down on Social Media was published on 5 September 2017. 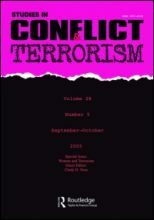 Using a dataset of more than 80 accounts collected during 2015, this article explores the gendered ways in which self-proclaimed ISIS supporters on Twitter constructed community around suspensions. Dr. Zoey Reeve joined UCL this September as VOX-Pol’s 2017 – 2018 Research Fellow. Zoey’s research will utilise Social and Evolutionary Psychology theory and methods, to think through and investigate online radicalisation processes. She will focus particularly on how normal psychological processes and mechanisms can help us understand how and why people engage with violent extremist content and some ultimately participate in terrorism. Her work will be supervised by the Department of Security and Crime Science’s Dr. Paul Gill. For more information on VOX-Pol’s Researcher Mobility Programme, click HERE. 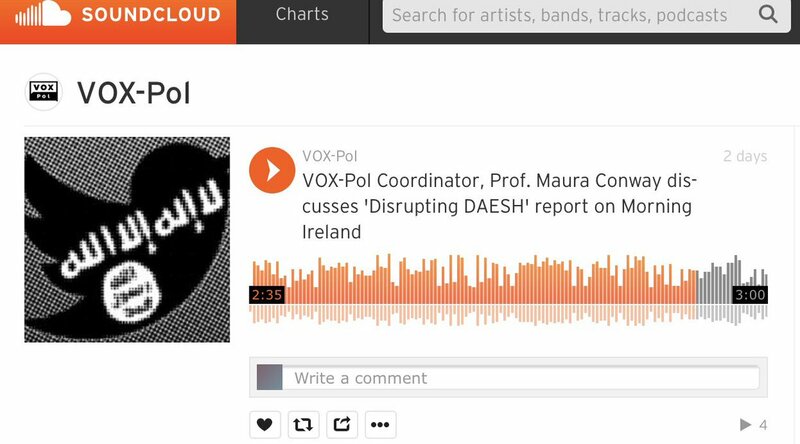 In addition to Twitter, YouTube, and Storify, VOX-Pol now has a SoundCloud account where we curate relevant audio content. VOX-Pol is convening a two-day workshop titled ‘Combating Online Extremism: State, Private Sector, and Civil Society Responses’ convened by the University of Oxford on 6 – 7 March, 2018. The workshop seeks to explore the emerging responses from politicians, think tanks, technology companies, and civil society to the proliferation of extremism and hate online. The workshop will take a global, comparative approach with a view to evaluating approaches to combating online extremism, as well as its implications for governance. VOX-Pol hosted a start-up workshop on 7 September 2017 in Dublin’s DCU Alpha, in collaboration with the Tech Against Terrorism initiative, to reach out to the tech start-up community in Ireland, to discuss counter-terrorism preparedness. The event was designed to educate start-ups on the nature of the threat, and the ways in which their platforms might be susceptible to exploitation, to learn what particular vulnerabilities firms might have identified, and to ascertain the best means for the Tech Against Terrorism team to provide support. VOX-Pol’s second Training Academy, a week-long event dedicated to exploring various topics at the nexus of violent extremism, terrorism, and the Internet, was held from 18 – 22 September 2017 in The Hague, The Netherlands. All participants were professionally-tasked in the area of violent online political extremism, drawn from a variety of law enforcement agencies, EUROPOL, international and EU institutions, national ministries, and social media companies. For further information on this past event, see HERE. ICSR, King’s College London hosted this VOX-Pol academic workshop on 16 – 17 October 2017. The aim of the workshop was to contribute to bridging the existing knowledge gap in the field of online jihadism, by bringing together panels of international experts from Europe and the Middle East to explore some of the findings that have been disseminated in languages other than English. Guest speakers were drawn from a range of countries including Lebanon, Kuwait, Saudi Arabia, Jordan, Morocco and France. Simultaneous translation in Arabic and French was provided. VOX-Pol convened a workshop titled ‘Countering Violent Extremism Online and the Impact on Civil Liberties’ at Harvard University’s Berkman Klein Centre for Internet and Society on 23 – 24 October 2017. Participants were drawn from a variety of backgrounds including academia, social media companies, and non-governmental organisations. The purpose of the workshop was to explore the challenges and opportunities facing actors engaged in countering violent extremism online, particularly the impact of content regulation on civil liberties. The workshop is connected with a VOX-Pol study being conducted by Central European University’s Center for Media, Data and Society on the same topic. VOX-Pol’s latest report, Disrupting Daesh: Measuring Takedown of Online Terrorist Material and Its Impacts, gained significant traction in the media upon its release. Islamic State’s Twitter Network is Decimated, but Other Extremists Face Much Less Disruption, The Conversation (21 August 2017) – Click here to read more. Newstalk 106-108FM – Moncreiff Interview with Maura Conway. To listen, click here. RTÉ Radio 1 – Morning Ireland Interview with Maura Conway. To listen, click here. Twitter Campaign against ISIS Allows Other Jihaadi Groups to Grow Online, Newsweek (16 August 2017) – Click here to read more. Twitter ‘Becoming Less Effective’ as Platform for Islamic State, The Irish Times (15 August 2017) – Click here to read more. Terrorism Is Faster Than Twitter, The New York Times (5 November 2017) – Click here to read more.